NOTAM information is generally classified into four categories: NOTAM (D) or NOTAMs that receive distant dissemination, distant and Flight Data Center (FDC) NOTAMs, Pointer NOTAMs, and Military NOTAMs pertaining to military airports or NAVAIDs that are part of the NAS. NOTAMs are available through Flight Service Station (FSS), Direct User Access Terminal Service (DUATS), private vendors, and many online websites. Altitude and height are in feet mean sea level (MSL) up to 17,999; e.g., 275, 1225 (feet and MSL is not written), and in flight levels (FL) for 18,000 and above; e.g., FL180, FL550. When MSL is not known, above ground level (AGL) will be written (304 AGL). 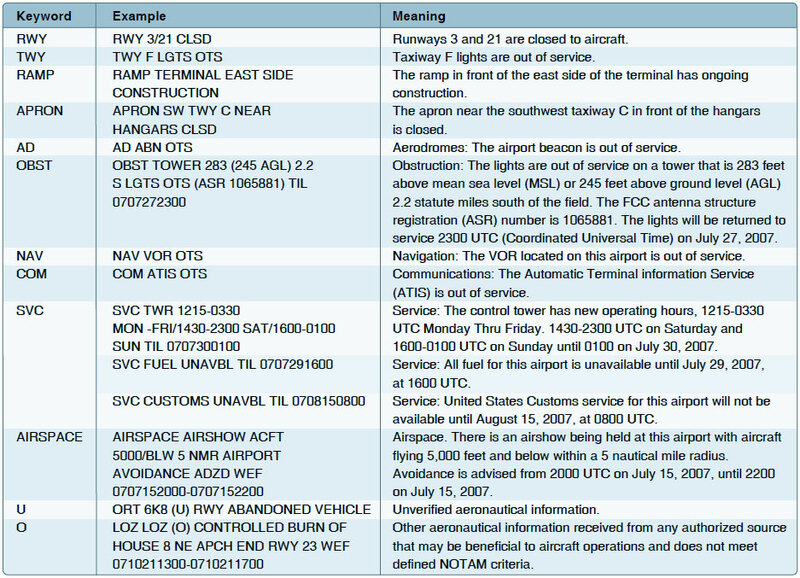 NOTAMs are available in printed form through subscription from the Superintendent of Documents, from an FSS, or online at PilotWeb (www.pilotweb.nas.faa.gov), which provides access to current NOTAM information. Local airport NOTAMs can be obtained online from various websites. Some examples are www.fltplan.com and www.aopa.org/whatsnew/notams.html. Most sites require a free registration and acceptance of terms but offer pilots updated NOTAMs and TFRs. In 2004, the FAA launched the Safety Program Airmen Notification System (SPANS), an online event notification system that provides timely and easy-to-assess seminar and event information notification for airmen. The SPANS system is taking the place of the current paper-based mail system. This provides better service to airmen while reducing costs for the FAA. Anyone can search the SPANS system and register for events. To read more about SPANS, visit www.faasafety.gov/spans.